The Montreal Dining Collection is all about versatility. 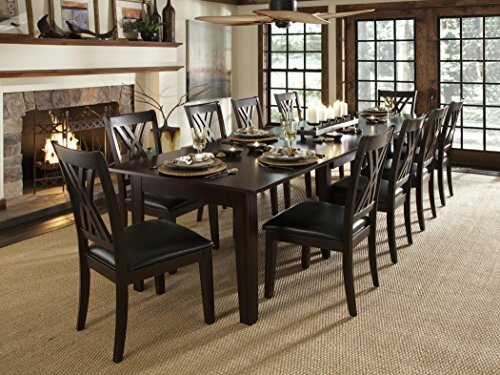 Constructed of Solid Rubber wood and finished in a 9-step Rich Cognac finish, the Montreal Dining Table extends from 60" to 132" and can accommodate up to 12 guests. The (3) 24" Self-Storing Leaves fit neatly under the table top when not in use. The Double X Back Side Chair features easy-to-clean Black Pebble Grain Upholstered Seating, 2.5" foam, and Pirelli webbing that provides superior comfort. The 56" Server offers an abundance of storage opportunities. The spacious cabinet below features wine glass storage and a fixed shelf. If you have any questions about this product by A-America, contact us by completing and submitting the form below. If you are looking for a specif part number, please include it with your message.